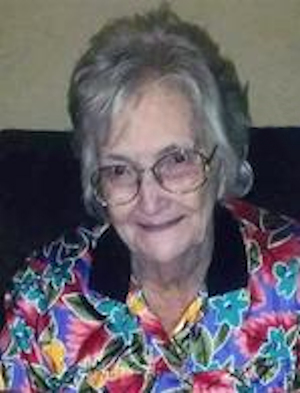 Obituary – Manning, Norma Lee (Sharp) « Perry High School Alumni Association, Inc.
A Celebration of Life for Norma Lee Manning, 88, of Enid will be Wednesday, April 12, 2017, 2:00 PM at the Grace Hill Cemetery Pavilion in Perry, Oklahoma with Rev. Don Bryant officiating. Services are under the direction of the Ladusau-Evans Funeral Home. Norma was born February 5, 1929 in Skedee, Oklahoma, the daughter of Fred and Volenia Watson Sharp and passed away April 7, 2017. 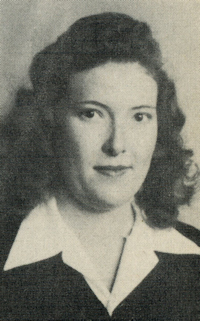 Norma was a graduate of Perry High School in 1946. She was united in marriage to C E (Edwin) Manning September 4, 1948 in Chandler, Oklahoma and he preceded her in death January 8, 1981. She was first employed at Southwestern Bell as an operator. Mr. and Mrs. Manning owned and operated Manning Texaco in Enid from 1963 through 1980. After his passing she was employed as an operator at St. Mary’s Hospital until her retirement in 1995. She enjoyed needlework, reading and doing crossword puzzles. She will be remembered for her great sense of humor. Survivors include two daughters, Becki Wichert and her husband Terry of Oklahoma City, Oklahoma, Beth Colby of Enid, grandchildren, Amy Wolever (Josh), Tara Logston (Trever) and their son Jayden, Chad Colby and his daughter, Kentley, a sister-in-law, Leah Doris Bridal(John) and numerous nieces and nephews and a host of friends. She was also preceded in death by her parents, two brothers and a sister. Memorial contributions may be made to OMRF, cancer division or St. Jude’s Children’s Hospital with Ladusau-Evans Funeral Home custodian of the funds.